Go back in time to 2009 and imagine you’re floating high above the Japanese archipelago on a crystal clear night. 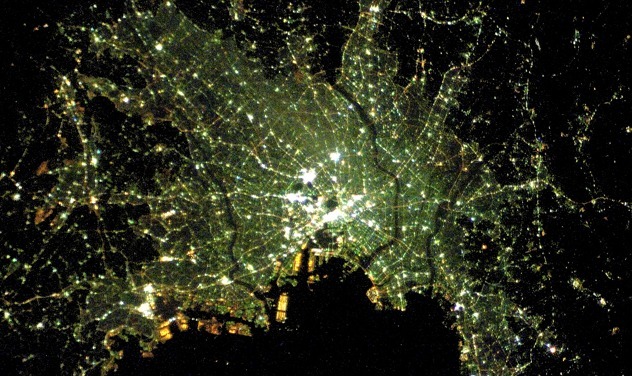 Far below, Japan’s electricity supply takes the appearance of billions of fireflies glowing yellow as they swarm across the transmission grid. Look closer and you’ll see 1,727 small balls of light: hydroelectric plants, perched on just about every sizeable river throughout the country. Another 2,791 medium-sized balls of light are the thermal power plants, blazing with coal, liquid natural gas, and oil imported from around the world. Especially prominent are the 17 whopping fireballs: clusters of nuclear power stations arrayed from Hokkaido to Kyushu that include the nation’s 54 commercial nuclear reactors. From each of these brilliant centers of generation, long glowing arms reach out toward cities and towns, sometimes extending hundreds of kilometers, branching and twining in smaller and smaller veins that eventually reach millions of houses and commercial buildings. This is the main electricity grid, which is divided into ten regions, each controlled by a monopolistic utility. Squinting, you can also make out about 3,000 fainter points of light. These are the independent power stations run by factories and other businesses to meet their own energy needs. Finally, if you’ve got the eyes of an eagle, you can detect a sprinkling of glittery dust scattered across the country: Japan’s solar panels, most of which are installed on rooftops. This is what you would have seen in 2009. Now imagine the same view in ten or twenty years from today. The 17 supernovas are gone. So are some of the fossil fuel megastars. In their place glow far more smaller pools of light, each surrounded by a small, dense frizz of transmission lines feeding nearby homes and shops. And the light sprinkle of dust you saw in 2012? It’s now as thick as powdered sugar on a beignet. If proponents of a decentralized, or distributed, energy system have their way, this is what Japan’s future electricity grid will look like. We don’t just need to shift to renewable energy sources, they say. We also need to fundamentally change the way we think about producing, storing, and generating electricity. In Japan the concept is often called “enerugi no chisan-chisho,” a phrase adopted from the local food movement. It directly translates as “local production and consumption of energy,” and more loosely as “grow your own energy.” Like the globalized industrial food system, Japan’s energy system is unsustainable, risky, and controlled by huge corporations. As of 2008, 90 percent of Japan’s electricity came from fossil fuels and nuclear reactors. Due to distribution inefficiencies, five percent of that was lost during transmission from the giant power plants to consumers. Why not unplug from that quagmire and create something smaller and better one community at a time? A handful of local governments, academics, and NPOs were already thinking about how to do that before 3/11. Then the disaster hit, bringing widespread power outages to Tohoku and exposing the rotting foundation of the nuclear power industry. Now, communities across Japan are thinking seriously about how to achieve energy independence. Kamaishi, a steel and fishing town on the coast of Iwate prefecture that lost over 1,000 people in the disaster, is among them. “We lost electricity for up to a month in some areas [after 3/11]. Until last year, we’d only had pre-planned blackouts,” Kamaishi city hall employee Takahiro Sasa told me in February 2012. A confident middle-aged man dressed smartly in a double-breasted suit, Sasa heads up both corporate relations and renewable energy development. He said the disaster changed how he and many others in town think about energy security. “We now believe we need to ensure that each part of town has its own independent energy source, at least to a certain extent. If there hadn’t been a disaster like this, I don’t think we’d have thought much about it,” he said. In fact, Kamaishi was already generating quite a bit of electricity before 3/11. Nippon Steel Corporation runs a large thermal power plant at its factory, and there’s also a wind farm with 43 1,000-kW-capacity turbines in the mountains a short drive from downtown. However, because electricity from these sources flows into a large regional grid operated by Tohoku Electric Power Company (Tohoku EPCO) rather than directly to local homes and businesses, it made little difference during the disaster. Sasa said he and his colleagues hope to reconfigure the grid so that, in the future, the town can use any electricity produced there. They also plan to add another 60 wind turbines in the next five years, put solar panels on recovery housing, help the steel mill transit from fossil fuels to wood waste and other biomass energy forms, and develop whatever other potential sources of renewable energy they can. The idea is not to cut off ties to the regional grid or go 100% renewable, but, rather, to produce and distribute enough electricity locally to meet basic needs in an emergency. Achieving that goal could be difficult. “Even if communities want to use what they generate, the current system doesn’t allow them to do so,” explained environmental economist Hidefumi Kurasaka, a strong proponent of community-led renewable energy development. Last year, Kurasaka’s research lab at Chiba University issued a list of Japan’s “energy sustainable zones.” According to the report, electricity generated from renewable sources exceeded total demand in 82 communities in 2010. Almost none of those communities were actually using the electricity they generated, however. Kurasaka explained that while anyone can generate electricity for their own home or company using solar panels or other micro technologies, things get complicated when producers decide to send electricity to other users. To begin with, government regulations generally prevent towns or companies from building and managing their own local transmission grids. Grid construction is also prohibitively expensive, and most cities lack the technical expertise needed to manage a grid or design energy policy (Tokyo is one of the few exceptions). Instead, huge regional utilities control the transmission networks. Renewable energy developers have little choice but to plug into these networks, which usually carry their electricity out of town and bring in electricity generated at thermal or nuclear plants elsewhere. Takahashi Suzuki, a press officer at Tohoku Electric, was not able to confirm that the utility turned down Kamaishi’s initial request. He said Tohoku Electric had offered one connection point about 20 kilometers from the wind farm, and added the utility’s recovery plan for the disaster area includes measures to increase renewable energy and related infrastructure. But he also admitted that, in the past, the utility has frequently been unable to offer connection points as close to renewable energy facilities as producers request, or to accept all applications for grid connection. “There are limits to the amount of renewable energy our grid can handle, and the number of wind power developers requesting grid connection has increased. In 2011 we instituted a bidding and lottery system,” he said. Grid limitations come up often in arguments against a rapid shift toward decentralized generation of renewable electricity. The amount of electricity from certain renewable sources (solar and wind in particular) varies widely throughout the day and year. If storage systems, monitoring technology, and other “smart grid” innovations are not incorporated along with new types of energy, electricity supply can become unstable. One way to dilute these fluctuations is to feed renewable energies into a grid with a large supply of nuclear or thermal power available around the clock every day of the year. To a degree, Murakami’s argument makes sense. If Japan were to suddenly destroy its national electricity grid and replace it with isolated microgrids fed only by renewable resources available locally, communities would be extremely vulnerable to local fluctuations in supply and demand, as well as to localized natural disasters. But this is not what most proponents of “growing your own energy” envision. Instead, they see households, businesses and communities making full use of local energy resources and having a degree of autonomy, yet also still being linked to a national grid. Tokyo-based political economist Andrew DeWit believes that while technical challenges to the rapid expansion of distributed renewable energy generation do exist, a bigger problem is “the political power of those interests wedded to the status quo.” Utilities profit from their control over a centralized grid, and they have traditionally enjoyed an extremely close relationship with the politicians and bureaucrats who determine energy policy. DeWit thinks the tide is turning against this old system. He points to statistics and anecdotes that suggest local and prefectural-level politicians, business magnates in the financial and high-tech sectors, and even major bureaucracies like the Ministry of Agriculture are re-thinking the energy status quo. The new feed-in tariff that ensures companies producing electricity from renewable resources get higher prices (and profitability) when selling to utilities goes into effect in July 2012. And a METI taskforce has been formed to debate breaking up utilities’ monopolistic control over the distribution network. “This revolution, if it really is of the scale it seems to be, is already reshaping Japan’s establishment. The old boys who can’t or won’t evolve are lumbering towards a cliff,” said DeWitt. Chiba University’s Kurasaka is less sure. “The government still hasn’t fully gotten behind the idea of locally-led renewable energy development. The feed-in tariff applies to any type of development – the goal is to allow renewable energy companies to profit. Big investors, like Softbank, are eager to get into mega solar for that reason. What I’m afraid is that mega solar projects will be developed in the disaster area but [the developers] will just be renting the land. The money won’t come into the community. Profits will go to companies like SoftBank, which are based in big cities, recreating the same structure we had with nuclear power plants,” he said. Kurasaka is determined not to let that happen. Earlier this year, he helped organize a symposium in Sendai to teach communities how to develop their renewable energy resources by combining investment from local businesses and credit unions with expert technical and policy advice from further afield. He admitted the skills involved aren’t simple. In this sense, the appropriation of the phrase “grow your own” from the food movement is misleading. Shifting from mega-corporate oil and gas to DIY solar and wind is certainly more of a leap than switching from store-bought veggies to homegrown ones. Yet Kurasaka pointed out that reconstruction offers a unique opportunity to rebuild energy systems in a new way. The earthquake, tsunami, and nuclear disaster wiped away the physical infrastructure for electricity generation and distribution all along the northeastern coastline. But the triple disaster also upended long-held assumptions about the system that provides them with energy. A vacuum, however brief in time, has opened in the center of Japan’s energy system. It could be the perfect chance to experiment with a new way of producing and distributing electricity, one that empowers local communities in both a literal and figurative sense. 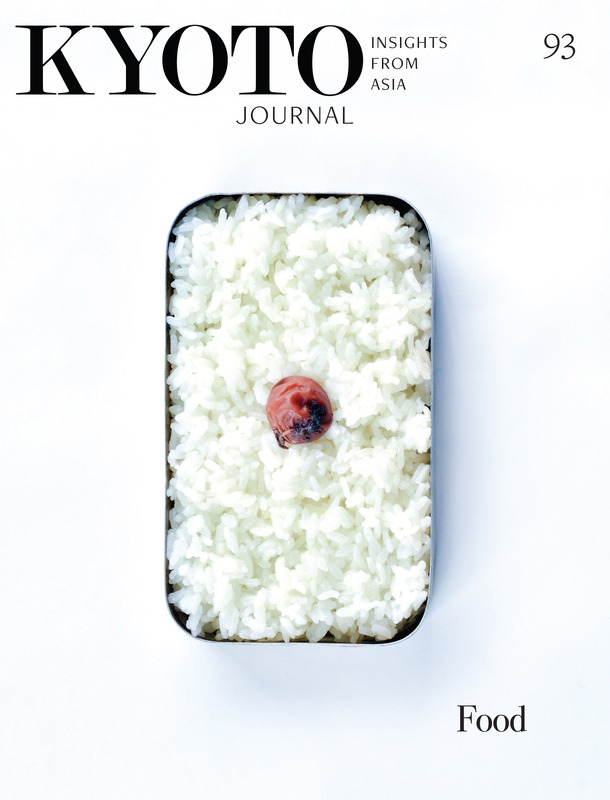 An Excerpt from FRESH CURRENTS: Japan’s Flow from a Nuclear Past to a Renewable Future, an upcoming special publication (summer 2012) on how Japan got to Fukushima and how it might create a renewable energy future.